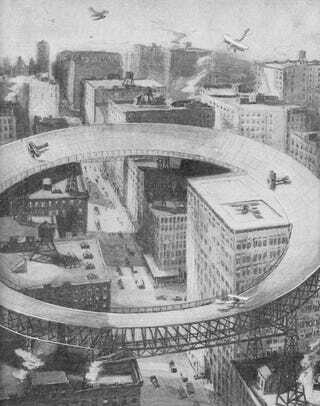 The June 1919 issue of Popular Science Monthly magazine envisioned the city of the future with circular tracks for taking off and landing. An article by Carl Dienstbach laid out the possible pitfalls of trying to move aircraft through American cities. "Clearly, city streets, flanked by high cliffs of architecture, lend themselves about as well for airplane landing and starting as they do for ice-boating." Dienstbach laments the fact that no one has yet invented an airplane that can "rise almost vertically from the ground," (the first functional helicopter wouldn't appear until the 1930s) but he explains that a man named Mr. H. T. Hanson has proposed a method of getting around this hindrance. "He would build the platform in the form of a circular, high-banked track — a track that would be constructed of light but strong iron gratings, so that sun and air would still find their way to the streets below." Dienstbach asks readers to imagine taking off each day from their home in the country toward their city office 80 miles away. "An hour after you have started from your own grounds, the lower part of Manhattan looms in sight. There are three great suspension bridges that span the East River." Believe it or not, I scoffed at the idea of an hour long commute until I remembered that I live in the delightfully car-congested metropolis of Los Angeles.